When you only have one child, and that child starts going to school all day, it is a lot harder to justify being a stay at home. Especially when you still won’t clean or iron. So when Averi started preschool in Tucson I took a part time job. It was fantastic. I was able to work from home, at my convenience. Plus the job was mainly socializing with hotels and stores, as well as people planning trips to Southern Arizona. Paid to chat? Sweet! Then we moved to Miami. Bye bye dream job. But I realized I could try to work at my other dream job. Hotel concierge. Spend all day telling people how to have fun? Yes, please. Get invited to restaurant and show openings so that I can recommend them to guests? Double yes, please. Then I read an article in a local magazine on Miami concierges. One concierge told a story of how they had a guest go out in a chartered boat. An hour or so later the guest calls, enraged, as there are not enough limes on the boat to go with her tequila. The concierge had to charter another boat just to bring her limes! The other stories were equally awful. And since I have no interest in being a drug dealing pimp, the dream of being a concierge will have to wait. So without a job, I needed to find a way to rationalize staying home. And I needed to find a way to make friends, as actually staying home is boring. So I became a joiner. I joined meetup groups, the local garden club, school groups, and even just started talking to random people. And I don’t like talking to random people. I also agreed to start a Girl Scout Daisy troop, as Averi saw an episode of Sophia the First that featured them and decided she needed to be one. And as any normal person knows, Girl Scouts means one thing. Girl Scout Cookies. Thin Mints specifically. Frozen, so that you can enjoy them all year long. We just had all the cookies that the troop presold delivered, and I needed to get them to all the moms. Which in my world means, let have a cookie delivery party. One of the moms offered to host at her house, which has a fire pit, so the girls could make smores. Excellent for the girls. But as you probably remember from above, I am working on making friends for myself too. And the best way to make friends is to give people alcohol. 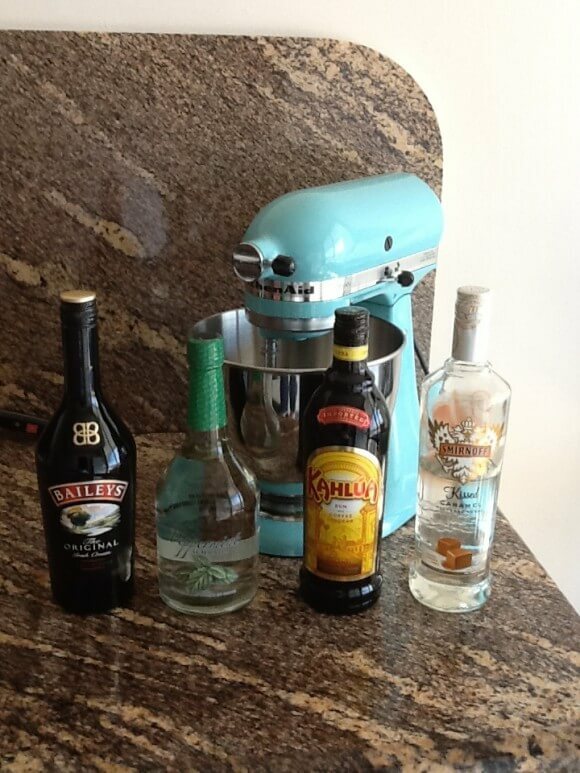 And I thought it would be fun to make the drinks cookie related. Which of course means I went to Pinterest. I found a recipe for a drink called “dirty girl scout”. I wanted to make it just for the name, and the fact that it was an awesome shade of green, but it had entirely too many ingredients, especially since I would be making it at someone else’s house. So I simplified. Baileys, Kahlua, and Peppermint Schnapps. 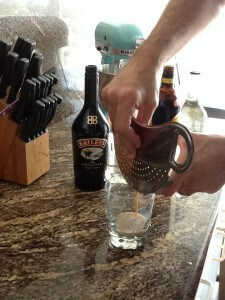 Mix equal amounts over ice, then pour into a glass. We used our spaghetti strainer for this part, cause we like to be classy when we day drink. But I also had some Caramel Vodka left over from a fall sangria drink I made for Halloween. So then I decided to make a version with the Vodka instead of the Schnapps, in honor of the Samoa cookie. You could add some Coconut Vodka as well, if you wanted to be more accurate. I do not like Coconut though, and was fine with not being accurate. And the results were still delicious. Pour equal amounts of alcohol over ice, shake, and then pour into cup. Drink up ladies. And eat your cookies!